Florida personal injury attorney Scott McCullough brings together the Lighthouse of Broward for the Blind and Visually Impaired and American Heritage School Plantation to create innovative solutions that will enhance the independence and safety of the blind or visually impaired. The pre-engineering students at American Heritage School were eager to explore ways and find solutions to further the independence and safety of the visually impaired. Attorney Scott McCullough, co-founder of McCullough & Leboff, P.A., a law firm that focuses on helping people who have suffered injury or loss in car accident cases, fall down events or medical/nursing home accidents, recently united Lighthouse of Broward and American Heritage School to foster an ongoing and important relationship. 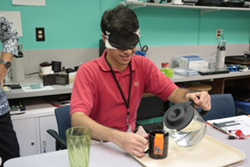 The partnership pairs the finest young minds of the next generation at American Heritage School with children and adults at the Lighthouse, the preeminent resource for the blind or visually impaired community. 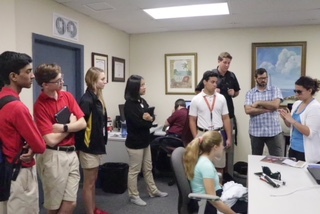 “The pre-engineering students at American Heritage School were eager to explore ways and find solutions to further the independence and safety of the visually impaired,” said McCullough, who is on the Board of Directors of Lighthouse of Broward. The mission of Lighthouse of Broward is to provide specialized rehabilitation and collaborative health care solutions that enhance the independence, productivity, and dignity of children and adults who are blind or visually impaired. All its services are tailored to individual needs by trained professionals working with the adult who has lost sight or the parent and visually impaired child to identify the exact skills that will lead to maximum independent functioning. About Scott T. McCullough, McCullough & Leboff, P.A. Scott T. McCullough focuses on personal injury, wrongful death, and medical malpractice. The attorneys at McCullough & Leboff have more than 20 years of legal experience handling personal injury cases. They bring a different perspective to injury claims that comes from the vast knowledge gained by representing clients as plaintiffs and defendants in personal injury actions. The firm’s only focus at this time is to help those that have been injured or suffered loss due to injury or death. For more information, please call (954) 989-3435, or visit http://www.flafirm.com.